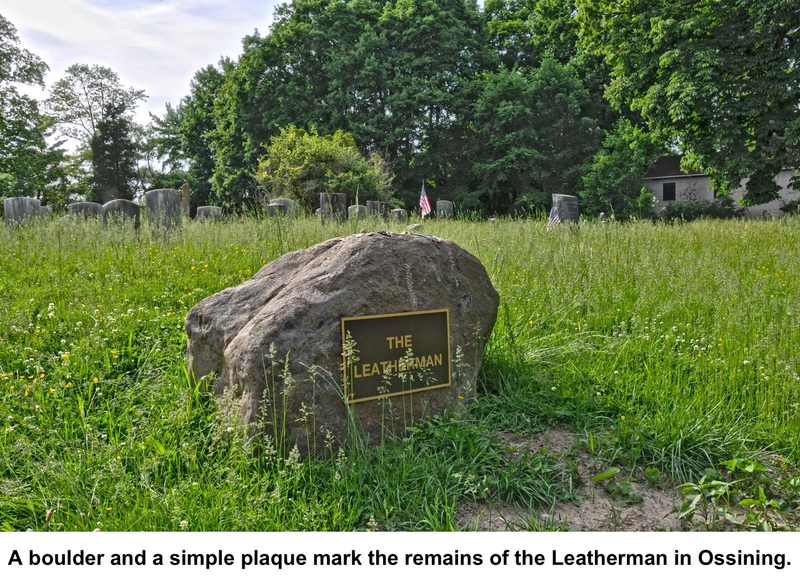 Many an odd character has set foot in Ridgefield, but few could outdo the Leatherman, a 19th Century vagabond whose strange life has led to many local legends in Connecticut and New York. While countless people saw him, little is known about this man the New York Times once called “uncouth, repulsive and wholly inexplicable,” but who was liked and respected by many people along his long, circular route. That he frequented Ridgefield seems certain, even though The Ridgefield Press said in 1884 that the Leatherman “as far as we know, has never included Ridgefield in his habitual route.” That conflicts with other evidence and a lot of oral tradition that says that, in fact, he regularly passed through town. It was as if he was an expected visitor. A few months after that entry, the Leatherman was dead. Just who was this mysterious character who has inspired at least one book, a television documentary, innumerable articles in newspapers and magazines, and even a song by Pearl Jam? 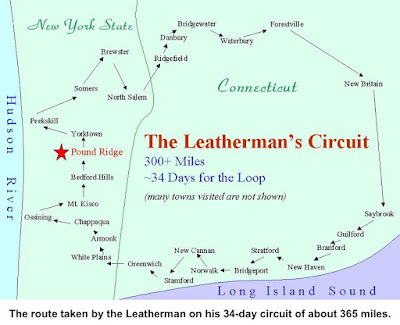 From the 1860s until 1889, the Leatherman walked a 365-mile route every 34 days through western Connecticut and southeastern New York. He spent the nights in natural shelters such as caves — often today called “Leatherman caves” — along his route. His shirt, trousers, coat, and hat were all made of pieces of leather, sewn together with rawhide. In some ways it looked like a suit of medieval armor. The Connecticut Historical Society reports his outfit weighed 60 pounds. He also carried a leather bag and a cane. “They say that one could hear the leather creak as he walked by, and there were some that also said you could smell the Leatherman coming!” says one account. He received food and other basic supplies from many people along his route, but did not beg for these; in fact, he often paid cash. Other accounts say he was fluent in French and could speak broken English. When he died in 1889, he was found in the possession of a French prayer book, suggesting that he was born either in Quebec or France. in Lyons, France, the son of a prominent leather tanner who went bust after some bad investments. The fact that Jules’s family was broke prompted his fiancee to cancel their impending wedding and she wound up marrying a rival suitor. Crushed in spirit, Bourglay fled to America as a stowaway on a ship. That account of his early days was apparently invented by a Waterbury newspaper, reports author Dan DeLuca. The fact is, DeLuca said, no one knows who the Leatherman was, where he came from and why he did what he did. 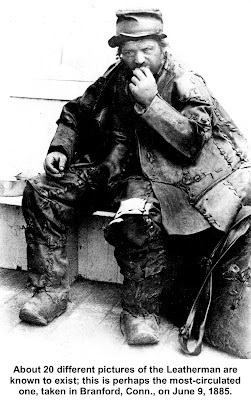 Among the few facts known about the Leatherman was his cause of death: Cancer of the mouth, said to have been brought about by love of tobacco. On Friday, January 25, 1889, The Danbury Evening News reported “The Leather Man was in Redding and called early in the morning at the residence of Dr. J. H. Benedict, where he asked for a breakfast. “He was readily recognized by Mrs. Benedict from his leather clothing, and she invited him into the kitchen. As Mrs. Benedict can speak French, she soon learned his wants, which were simply coffee and she furnished him with all he desired. He drank the full of two large bowls, into each of which he put a teacupful of sugar. “He explained that he was unable to partake of solid food on account of his cancer, which prevented chewing. He conversed for a short time with Mrs. Benedict in French, until she asked him of his antecedents and then he became suddenly and stubbornly silent and spoke in his broken English. “His cancer is rapidly eating away his life. The right cheek is entirely gone, including a portion of the lower lip. He would not allow Dr. Benedict to dress it or Mrs. Benedict to do anything for his comfort, save to give him the coffee and a bottle of milk. He had, in fact, undergone brief treatment, but not willingly. The previous year, 1888, the Connecticut Humane Society had him arrested and placed in a Hartford hospital. But because he was diagnosed as “sane except for an emotional affliction,” had money and wanted to get out, he was released. Where did he get his money? Paul Baker wrote in his 1947 story that after he had arrived in America, the Leatherman received a small legacy from a relative. “He deposited the money in a bank in Port Chester, N.Y., and from time to time while on his travels, would go there to draw upon his account.” Like so much else about the Leatherman, this report could not be confirmed. 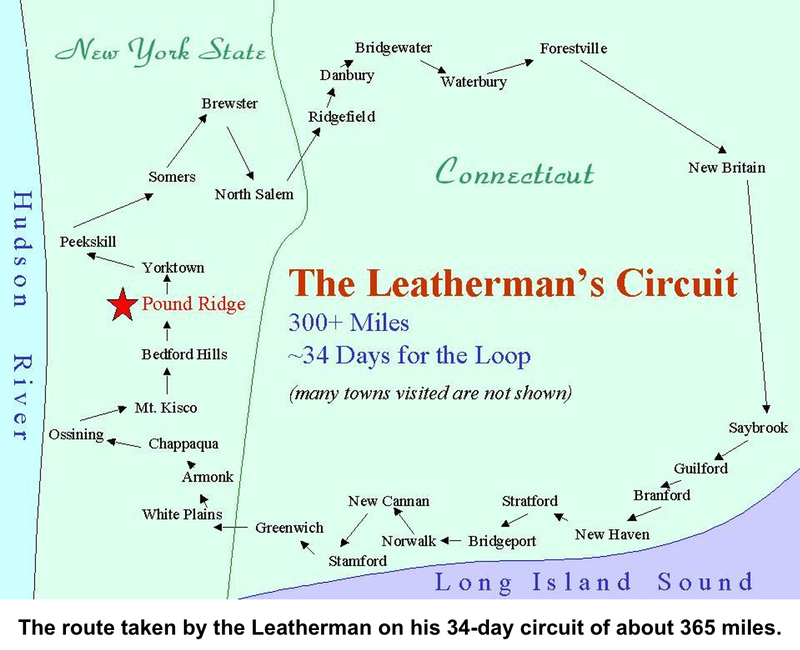 The Leatherman often followed railroad lines in his travels and it is known that he had visited the Branchville area, though not necessarily on his regular route. Redding historian Brent Colley says a cave north of the Branchville station was likely one of his stopping places. “The back end of the cave has a natural chimney, which is common in other Leatherman caves and is not easily found (another key feature),” he said. He was buried in Sparta Cemetery in Ossining. In 1953, a local historical society placed a headstone on the grave that incorrectly said he was Jules Bourglay of Lyons, France. Because it was only a few feet from the busy U.S. Route 9 highway, the Leatherman’s grave was moved in 2011 to another spot in the same cemetery — this time with a marker that says only “The Leatherman.” The only remains found were a few nails, possibly from the coffin. The dirt and nails were placed in a new pine box for the reburial. Smile on his face. Axe in his pack.